TeleCommunication Systems (TCS), a world leader in secure and highly reliable wireless communication technology, has announced at the CTIA Super Mobility Show the availability of the VirtuMedix® mobile app for Android and iOS devices. Specifically designed for caregivers and patients, this new mobile app delivers the benefits of VirtuMedix's secure, highly collaborative telemedicine platform with the convenience of on-the-go care. According to a recent study by the National Business Group on Health (NBGH), online doctor visits will skyrocket in the coming year. Last year, 48% of 140 large employers surveyed by NBGH made telehealth options available. In 2016, that number is expected to jump to 74%. Telemedicine is estimated to save U.S. companies more than $6 billion a year in healthcare costs, according to consultant Towers Watson. 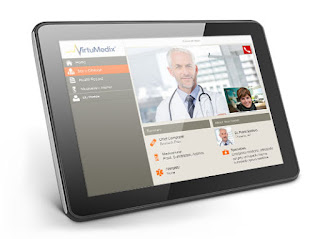 The VirtuMedix platform and its mobile app create a continuum of care within communities across the country and allow physicians to connect conveniently with patients by leveraging mobile devices. TCS has added nearly 1,000 providers to its VirtuMedix platform over the past six months. Supports patient-physician interaction anytime, anywhere and on any device, including personal computers, smartphones and tablets. Enables continuous care for patients whose conditions or locations make office/hospital visits inconvenient or impractical. Saves money and maximizes treatment efficacy by enabling physicians to identify and treat patients' conditions in advance of a medical visit and before conditions escalate. Ensures highly reliable security of patient data and platform access through the first and only telemedicine platform with its code base audited for cybersecurity vulnerabilities. Allows physician groups, hospitals and other caregivers to expand their patient reach, increase efficiency and differentiate themselves in the marketplace through superior, convenient care. Features proven TCS technologies and expertise, including encryption, messaging and location. HIPAA-compliant audio/video communication and information storage, which protects the privacy of patient information and allows physicians to consult securely with patients. Simple user interface and toolsets, which make it easy for clinicians to view various on-call rosters and to manage patient volume. Continuity between web platform and mobile application allows patients to move seamlessly between two devices. For example, patients can use the mobile device's camera to add high-definition photos while in a web consultation with the physician. TCS Commercial Software Group President Jay Whitehurst said: "In today's connected world, the demand for digital health tools is growing at a substantial pace. TCS' new VirtuMedix mobile app allows patients to consult easily with their doctors via their Android or iOS device, whether at home, at work or on the road. For physicians, this mobile app delivers value-added features designed to help them provide the best possible care to their patients. Physicians can identify patients in the queue, check in-progress consultations and review summary patient information. This mobile app is a breakthrough for physicians and their patients; it underscores TCS' continued commitment to provide best-in-class solutions to the healthcare market." For more information or to become a VirtuMedix-licensed caregiver, please stop by TCS Booth 4510 at the CTIA Super Mobility Show in Las Vegas, September 9 – 11, 2015, or visit www.virtumedix.com. 0 comments on "VirtuMedix Mobile App for Android and iOS is specifically designed for caregivers and patients"